How are VUV Detectors Unique? 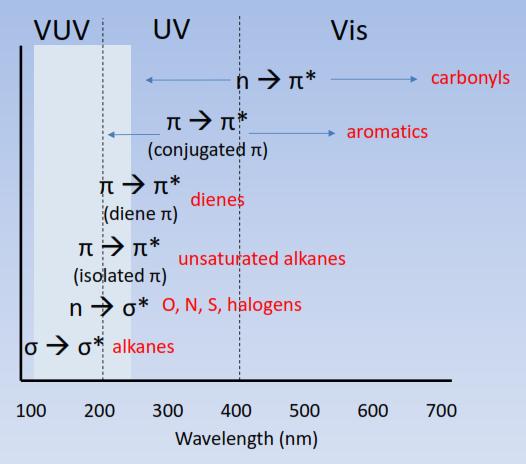 All gas phase compounds absorb strongly in the VUV spectrum with the exception of typical carrier gases nitrogen, argon, helium, and hydrogen. VUV light generates electronic transitions in most chemical bond categories including ground state to excited state σ→ σ* and π→ π*. VUV spectra reflect the absorbance cross section of compounds and are specific to their chemical composition and structural arrangement. VUV detection delivers unparalleled isomer selectivity and resolves analyte co-elution through spectral deconvolution. VUV detectors are intended for gas chromatography and streaming gas applications.